Egg Paratha is a fulfilling and protein-packed Indian breakfast recipe. 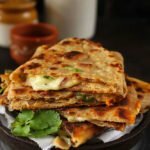 A simple whole wheat paratha layered with a cheesy egg mixture is what this breakfast recipe is all about. On the nutrition front, it is loaded with protein and the carb content required for a good burst of energy that will keep you going till lunch or longer. 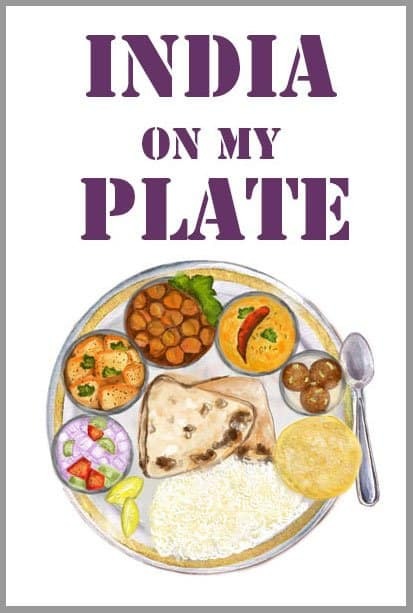 Punjabi breakfasts are typically rich and filling, with an onus on ingredients that help one survive the hard day at fields, generate enough energy to carry out physical tasks and stay replenished till the next meal. This favorite family breakfast is easy to prepare, scrumptiously flaky, slightly crisp and is perfect to start the day. Eggs for breakfast: If you aren’t already aware of it, eggs are a major source of energy and protein. 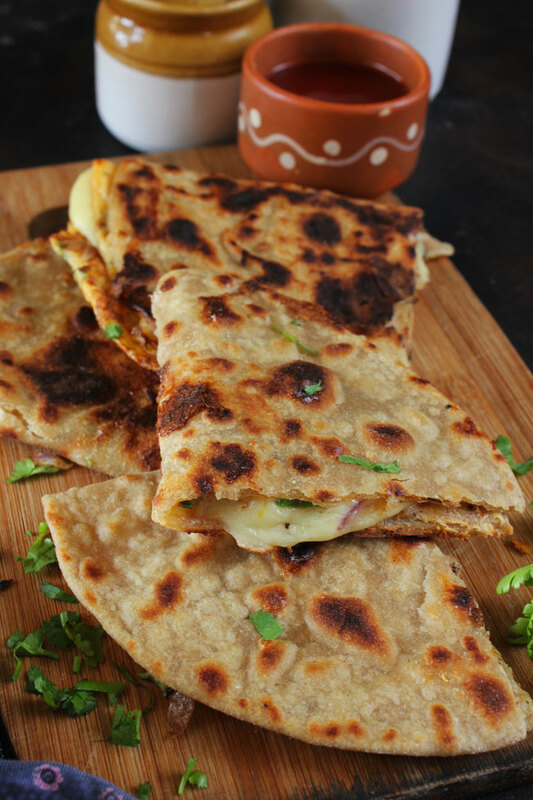 If you an egg lover, this egg paratha recipe is a delightful way to eat eggs for breakfast. Anda paratha can be served up with a couple of chutneys on the side and a steaming hot cup of tea to go with it. Can you feel the bliss already? 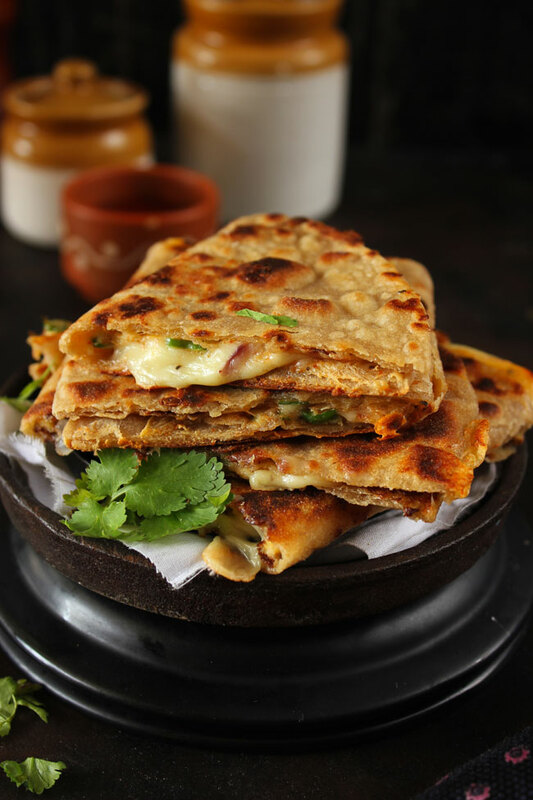 To make the stuffed egg paratha more interesting, we have graced it with loads of cheese — an indulgent and gratifying twist to the anda paratha. 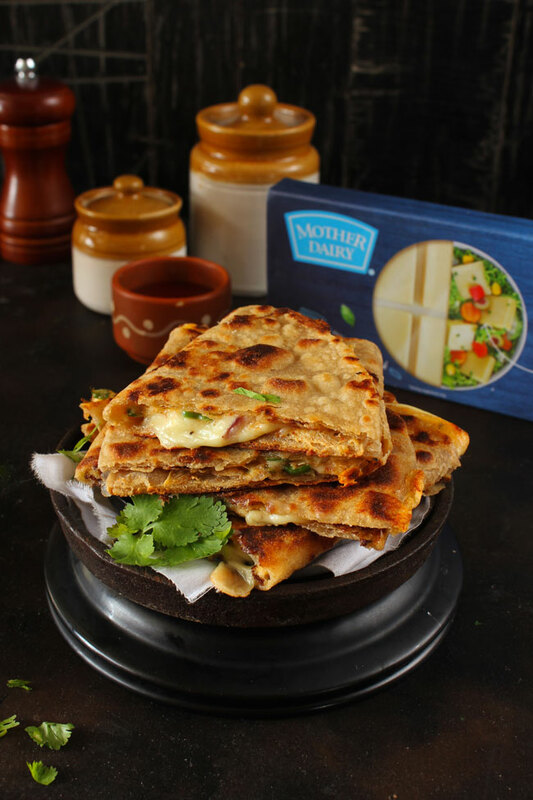 We have used the Mother Dairy Cheese Cube for this stuffed egg paratha recipe. You can watch the step-by-step process to make these stuffed peppers at Mother Dairy Fresh Delights Instagram Handle. 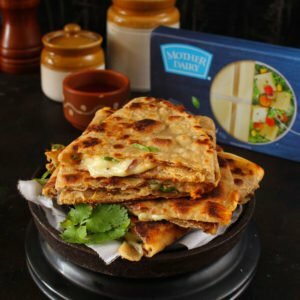 How To Make Egg Paratha? Anda Paratha can be prepared in many ways. Some methods recommend the egg mixture layered between two separate sheets of paratha. On the other hand, in Mughlai paratha egg mixture is spooned into the paratha layer and then sealed like an envelope. In this method, we are cooking the paratha first, spreading a generous layer of egg mixture, cook it and at last, fold the paratha into the half. The dough for the paratha can be kneaded the night before and stored in the fridge. You can use frozen paratha or readymade roti available in the supermarket as well if you are short on time. Prepare the vegetables for the egg paratha during the previous night and store in an airtight container in the fridge. Egg Paratha is a fulfilling and protein-packed Indian breakfast recipe. 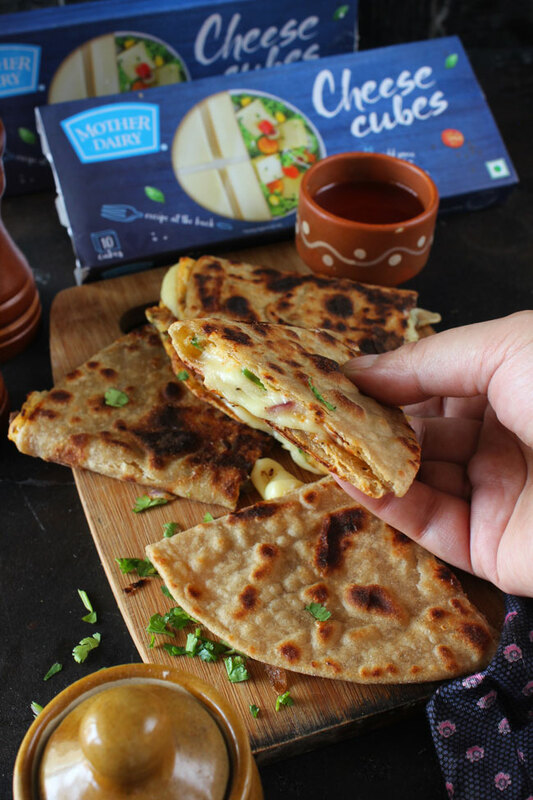 Learn how to make cheese stuffed egg paratha in a few simple steps. Bind soft to touch yet firm chapati dough with whole wheat flour and water. Coat with oil. Cover with a kitchen towel and set aside. Whisk eggs, onion, cheese and the remaining ingredients until well combined. Heat a flat pan (tawa). Roll out a round paratha with one small portion of the dough. Place the paratha on pan, cook from both the sides, smear with a teaspoon of oil and cook till little bit crisp. Now, pour 1/4 Cup of egg mixture over the paratha. Cook for 2 - 3 seconds. Flip and cook the egg side nicely. Once again, flip the paratha, add more grated cheese and fold the paratha into half. Press gently and cook for few seconds till cheese is nicely melted. Cut into half and serve immediately with ketchup and chutney. Thanks to our friends at Mother Dairy for sponsoring this post, and making sure we always eat the best of dairy produce.